Golf Invasion - Ponte Vedra Style! The DELUGE has finally lifted, the flowers are in bloom and the sun is out - just in time for THE PLAYERS Championship. Welcome to Ponte Vedra, golf fans! Come hungry - THE PLAYERS have cooked up some treats for you - and we've got the Food and Bev scoop right here. 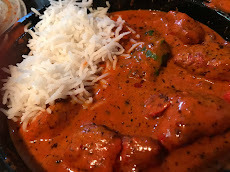 THE PLAYERS listened to fans and expanded the food options for 2013 to include gluten-free, vegetarian and low-calorie options. The Naked Mburger from M Shack and a Skinny Turkey and Pepperjack Wrap are just a few of the upgraded options on hand. Also new to the menus this year is gluten-free beer! 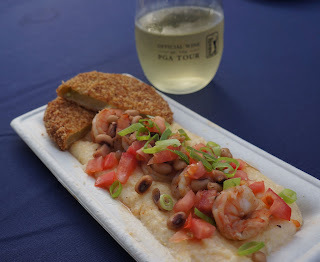 Specialty items like Mayport Shrimp and Grits with a Fried Green Tomato – THE PLAYERS Signature Item – as well as Sawgrass Sliders and a Grilled Steak Sandwich are available at various locations around the course. Some popular local restaurants will be present serving treats in three locations. Taste of JAX showcases Indochine, Metro Diner and Pele’s Wood Fire, while Restaurant Medure hosts Wine & Dine on 9 with the BERINGER® Wine Bar. Brucci’s, MShack, Bono’s BBQ, Tropical Smoothie Café and Firehouse Subs round out the selections in the Food Court. Of these, my pick would be a pizza from Pele's, or a hot sub from Firehouse, with a Tropical Smoothie to wash them down! Peterbrooke Chocolatier will sell signature chocolates along with mini-PLAYERS Championship trophy replicas in merchandise tents, in the clubhouse and in all of Peterbrooke’s retail locations. Kid-friendly options such as fruit and peanut butter and jelly sandwiches will be available at most concession stands around the course. Families can also visit The McKenzie Noelle Wilson Foundation Kid Zone at the Nicklaus Gate for the largest selection of kid-friendly favorites. Grilled cheese, cheese pizza, junior hot dogs and fruit cups can be purchased in the Kid Zone. New this year, families can bring in a gallon-sized clear plastic bag to tote snacks, sandwiches and more for the family (although no outside beverages are allowed). Eight Mobile Refreshment Center carts will roam the course selling water, soda and beer so you can stay hydrated and not miss a minute of the action. Chilled, filtered drinking water is also available in the new, permanent restrooms near The Patio and Wine & Dine on 9; so keep that bottle and refill it to stay hydrated, be environmentally friendly, and save money at THE PLAYERS. Fans 21 and over can stop by The Oasis (between 9 and 18 tee boxes) and visit the air-conditioned NOLET’S® Silver Lounge. The Oasis boasts a rear deck for prime views of No. 9 tee and serves two can’t-miss signature cocktails – THE PLAYERS Punch and the Sawgrass Splash – in addition to other food and drinks. Fans can purchase spirits in The Oasis, Stadium Village, Taste of JAX, Wine & Dine on 9 and The Patio. Friends (who may remain nameless) but who were booted from the course in years past for brandishing a phone during the main event might like to know that THIS YEAR you can bring your phone with you - as fans are encouraged to interact with the game by playing "Closest to the Pin" at the iconic 17th hole. So Tweet away, Pete! But please silence those ringers, people, you don't want a golf club wrapped around your head. Have a fun, safe, DRY yet HYDRATED time!